I want to start this roundup with a huge THANK YOU to everybody who participated this round -what a blast! And thanks to my Rachel, Deb, and Simona for allowing me to indulge by combining Cook the Books with Food 'n Flix this month - foodie books and foodie movies... when paired with friends and food, what more could a girl ask for? Everybody's submissions were so inspired - it was such fun reading through them. I really, really was wishing that we could bring everything to one giant table and enjoy a wonderful feast. But, in lieu of that, gathering them all together virtually will have to suffice. 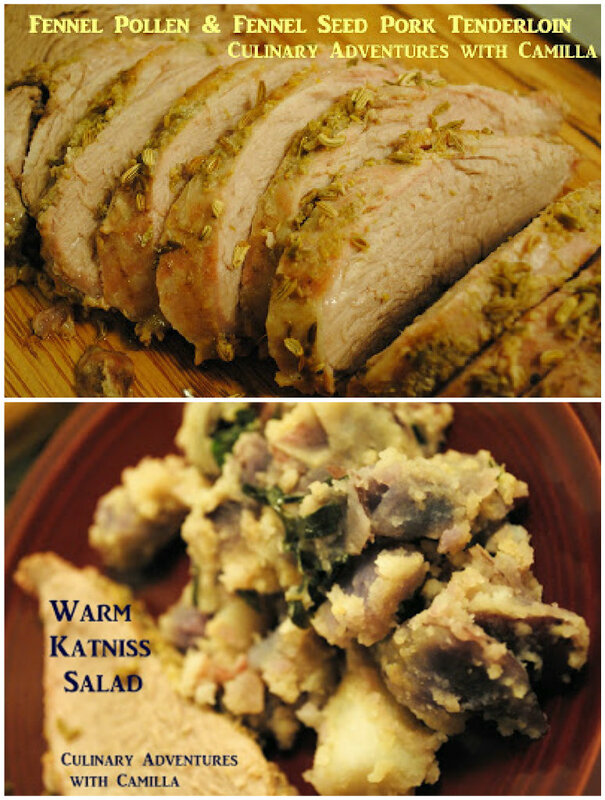 Let's begin with this Warm Katniss Salad and Roasted Pork Tenderloin from Camilla at Culinary Adventures with Camilla. Armed with her son's bow and arrow, she envisioned that roasted pig on the gamemaker's table - complete with apple (but in the end decided to forgo the whole pig and go for just the loin, instead). Add a nice side of "katniss" salad with goat cheese, that could have been made by Prim, and you have Camilla's contribution this month. Speaking of goat cheese, next up is Alicia of Foodycat's Goat Cheese and Persimmon Toast , inspired by Peeta. 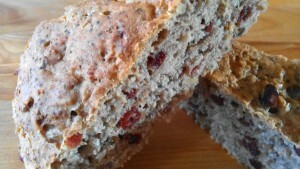 The life of a baker (and family) may seem ideal, but in actuality often consists of living on stale bread. What better meal to make of that bread than toast with something delicious slathered on top? 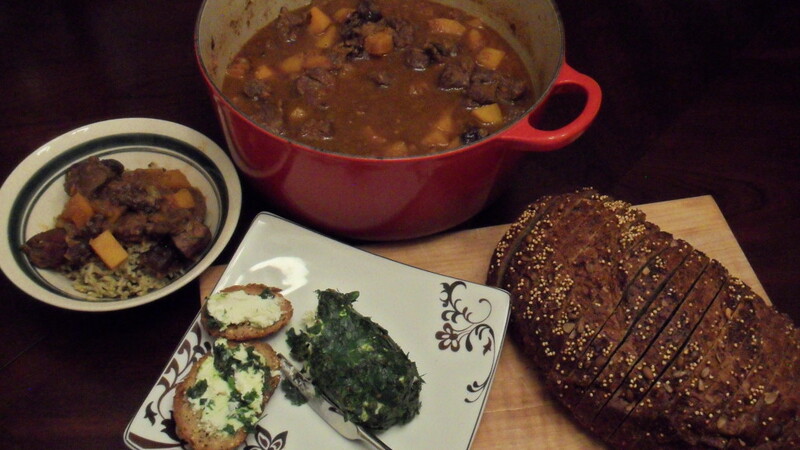 I do not think that any Hunger Games-inspired feast would be complete without the contribution of Katniss's favorite dish, Lamb Stew with Dried Plums . No need to worry though, because Sarah at WELLDINED brought a pot full, with some goat cheese rolled in herbs and rustic seed bread on the side. Drawing inspiration from the hunting and foraging prowess of Gale and Katniss, Claudia at Honey From Rock made a local meal using foraged dandelion greens, cassava root and lemons from her own land, and duck resulting from a trade with a friend to make a meal of Roast Duck with Cassava and Dandelion Greens . Reading, watching, and cooking along with both Cook the Books and Food 'n Flix for the first time, Caroline from Caroline Makes decided to recreate the first meal which Katniss and Cinna share when they meet in the Capitol, Chicken in Orange Sauce & a pudding the colour of honey. Rolls shaped like flowers, chicken and chunks of oranges in a creamy sauce, and tempting pudding... need I say more? Overwhelmed with all of the mouthwatering descriptions of food in the book and what it actually meant to the starving people of the districts, Tina from Squirrel Head Manor made not only this Rabbit Stew w/ a K to mark Katniss's first catch in a snare, but a line-up of other inspired dishes like Sauteed Rabbit, Gale's Marrow Bone Beefy Soup, and an Apple Tart. Also joining us for the first time is Anne Marie from This Mama Cooks! Inspired by a dish mentioned a few times, usually when Katniss was under a bit of stress (wait, wasn't that pretty much the whole story!? ), "hot grain smothered in beef stew", this Slow Cooker Meat Stew w/ Brown Rice is packed with veggies and served over brown rice (plus it's gluten free). Comfort, indeed. With many of her favorite foodie moments coming from Greasy Sae, it's no surprise that Danielle of The Growing Foodie was inspired to make a dish of Wild Dog Soup (Beef Udon Noodle Soup) after dining out with a friend and being served from a huge pot with Udon Noodle soup being ladled out into waiting bowls. I can almost close my eyes and picture the black market! 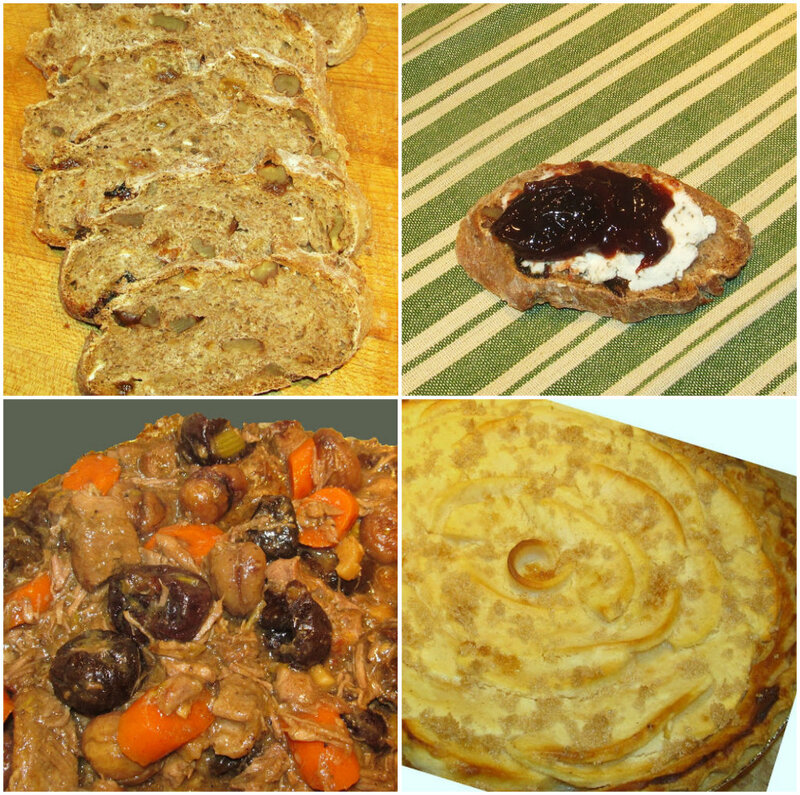 Peeta's Gift of Bread (Hearty Bread filled w/ Raisins & Nuts) to Katniss on that rainy day when she was weak from starvation is our contribution from Debra at Eliot's Eats. She was inspired by food from District 12 - "simple food, comfort food, food of love". 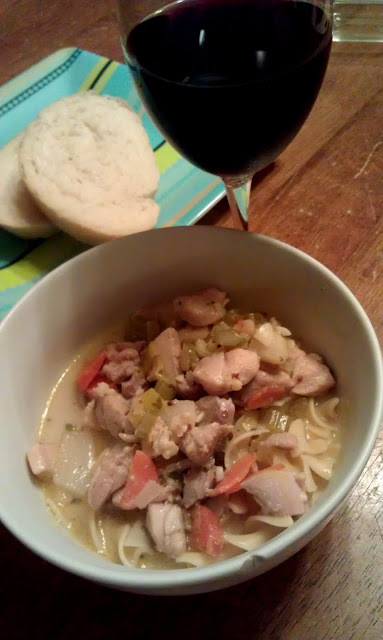 From the beginning, my CTB co-host, Deb of Kahakai Kitchen knew that she wanted to make something "comforting, simple and nourishing - a warm bowl of soup". 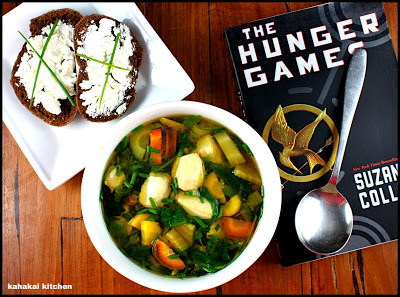 Drawing inspiration from Katniss's freshly caught fish and foraged greens, as well as the meal that Katniss made for Peeta by foraging and using little bits of leftover groosling, she brings us this beautiful bowl of Locavore Fish & Greens Soup (and some dark bread slathered with goat cheese on the side). 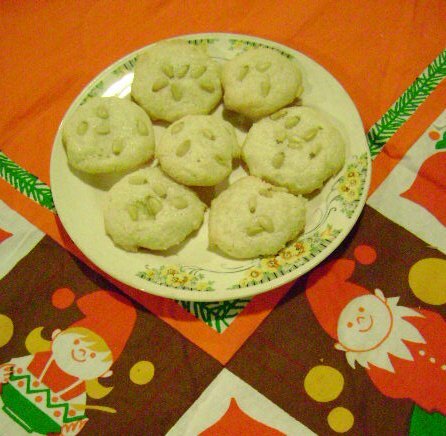 Inspired by a scene in which Katniss pulls bits of pine bark from the trees to chew on the pith beneath, one of my other co-hosts, Rachel of The Crispy Cook came up with these lovely Pignoli Cookies. With the combination of two deliciously "piney" ingredients, pine nuts and rosemary, I cannot get the thought of these cookies from my mind. Ana from Sweet Almond Tree also had a tough time deciding on just one dish to make for The Hunger Games. But lucky us, because she devised a feast for Katniss, which included Whole Wheat Raisin & Walnut Bread (spread w/ plum jam & goat cheese), Lamb Stew w/ Dried Plums, and an Apple & Goat Cheese Tart. 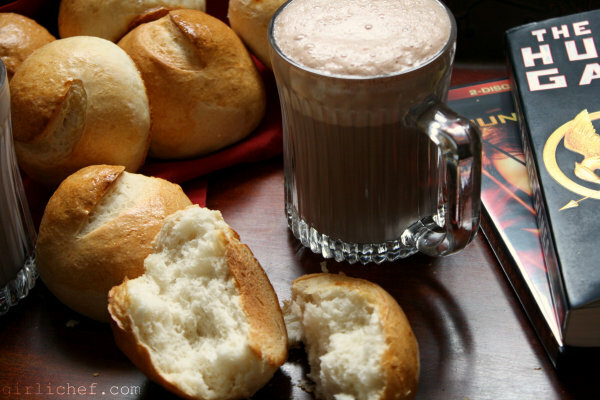 I will close out this virtual feast with my (Heather at girlichef) frothy, Mexican Hot Chocolate w/ Brötchen for dipping inspired by the passage in the book in which Katniss tries hot chocolate for the first time in her life. Taking a cue from Peeta and dipping pieces ripped from a freshly baked roll, Katniss gets lost in this bit of comfort and decadence. Again, thanks so much to everybody who joined in this round - I thought everybody's submissions were beautifully inspired. And just a heads-up, I will be posting a very similar roundup over at my place shortly... Food 'n Flix is a bit different from Cook the Books in the sense that each month we "travel" to different hosting blogs each month for our announcements and roundups. Since I was hosting this double feature, I will be pulling things together at girlichef, as well. 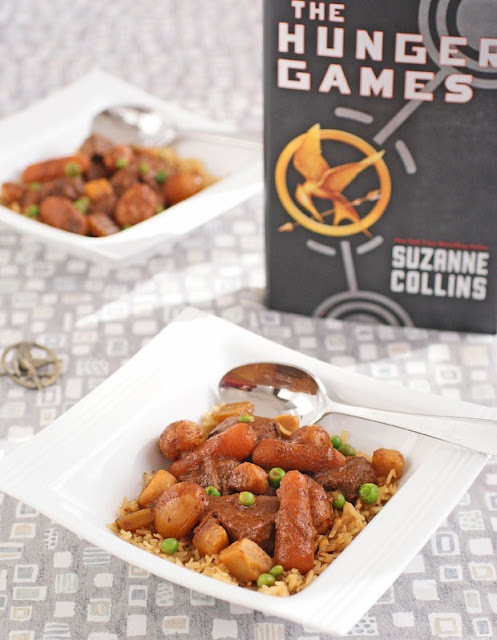 I can't wait to hear what our judge Wendy thinks about this food inspired by The Hunger Games! While we're waiting, be sure to hunt down our next Cook the Books selection, The Shape of Water which will be hosted by Rachel (she'll introduce us to her selection soon)! And also, if you enjoyed the Food 'n Flix portion of this event, you won't want to miss our selection next month (Today's Special) which, incidentally, is hosted by another of my fellow CTB hostesses, Deb! Fabulous round-up! And welcome to the new participants! Great round up and a nice bit of participation. This book was an excellent selection. Well done! It was so nice to welcome so many new participants to Cook the Books! I love the diversity of the blog posts. Great job hosting this round, Heather, and thank you to Wendy for agreeing to be our Guest judge! I'm so sad that I couldn't play this time! Having read the book(s), I was excited to play in this combo! Everyone made such wonderful food!! I was planning on Lamb stew w/dried plums myself, but of course...no lamb to be had. Regardless...your round up dishes are marvelous! Welcome to the new players!! I wholeheartedly agree....Wendy is going to have too much fun judging this round! Nice job everybody. It's great to see some new participants. Lovely roundup, Heather.